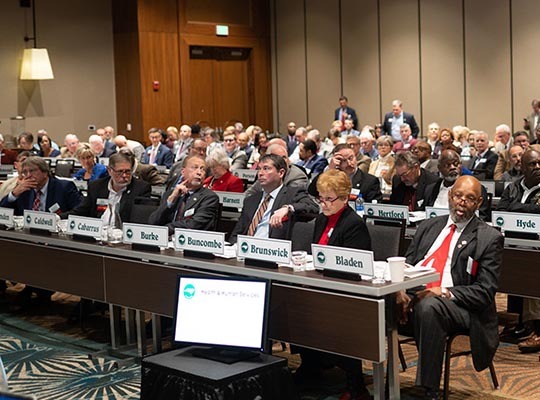 Last week, Cabarrus County commissioners joined voting delegates from counties throughout the state to determine the North Carolina Association of County Commissioners’ (NCACC) legislative priorities for the 2019-2020 biennium session of the North Carolina General Assembly. Governor Roy Cooper delivered keynote remarks and thanked county commissioners for their commitment to public service. Kevin Austin, NCACC President Elect and Yadkin County Commissioner presided over the two-day Legislative Goals Conference, which was held January 10-11. Cabarrus County sent Commissioner Lynn Shue to serve as a voting delegate to the conference to debate, amend, offer new proposals and cast votes on the Association’s guiding principles and legislative priorities, which guide advocacy efforts at the General Assembly. 1)	Seek legislation, funding, and other efforts to expand digital infrastructure/broadband capability to the unserved and under-served areas and residents of the state. 2)	Seek additional revenue sources, including a statewide bond and lottery proceeds, to equitably address statewide public school and community college capital challenges. 3)	Support efforts to preserve and expand the existing local revenue base of counties and authorize local option revenue sources already given to any other jurisdiction to all counties. Oppose efforts to divert to the state, fees or taxes currently allocated to the counties or to erode existing county revenue streams. 4)	Support provision of state resources to ensure county ability to provide essential public health, behavioral health and social services, with specific consideration to the challenges of incarcerated persons, the continued county role in behavioral health governance, and programs addressing substance use disorder, throughout Medicaid transformation. 5)	Seek legislation to repeal the statutory authority under N.C. Gen. Stat. 115C-431(c) that allows a local school board to file suit against a county board of commissioners over appropriations to the local board of education’s capital outlay fund.